Rural Action is very proud to announce its new alliance with the Appalachian Carbon Partnership as part of our effort to support sustainable forestry in Southeast Ohio. Carbon trading represents an opportunity for landowners to profit, not from traditional extraction methods such as mining and logging, but rather from allowing trees to grow and gather carbon from the atmosphere. Rural Action now represents all of Southeast Ohio in this partnership, covering 32 counties in Appalachian Ohio as well as four other neighboring states . Read on for more information about carbon trading and how you can take part in this new market courtesy of your friends at Rural Action. At the core of the carbon trading market is the fact that forests efficiently reduce carbon dioxide in the atmosphere when they grow. Growing trees take in carbon dioxide, which is one part carbon and two parts oxygen. They use the carbon to build new wood and release the oxygen back into the air. Through the managed forest carbon offsets market, landowners are paid for the amount of carbon dioxide that is removed from the atmosphere by their forests and stored as a building block of new wood. One carbon offset is equal to one metric ton of carbon dioxide, or its equivalent for another greenhouse gas such as methane, sulfur dioxide or nitrogen oxide. Greenhouse gasses trap heat from the sun. This is the main cause of climate change. The service that trees provide to remove carbon dioxide from the air has gained more attention as climate change has become a global threat. Forests that are well managed can take in additional carbon dioxide and keep the carbon locked in their wood for long periods of time. To be eligible for this market, the carbon offsets must be the result of certified sustainable forest management. This means that forest landowners must provide documentation to prove that the offsets are real and result from certified sustainable management of existing forests. 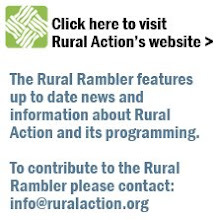 Contact Rural Action's own Susi Rankis to learn more about the program requirements and to request an enrollment packet: susi@ruralaction.org. It's time to get growing Ohio!